Aloha! 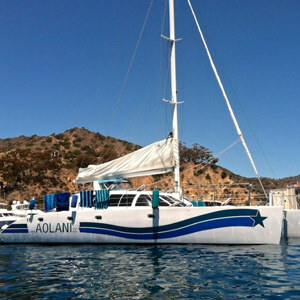 Welcome to Aolani, San Diego’s premier private yacht charter company. Celebrating 15 years in business, family owned and operated since 2003, we strive to offer a truly unforgettable, top-notch experience for your sailing adventure. 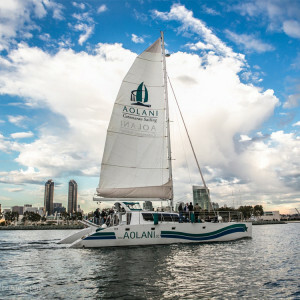 Whether for a wedding, corporate event or holiday, setting sail with Aolani is the perfect way to celebrate any occasion. We are happy to take you out into the open ocean for a whale watching adventure or anchor off an island for a filming location. We can also help you host a graduation, family reunion, or birthday party surprise. No other venue can offer a better value, more fun, or such an incredible experience. 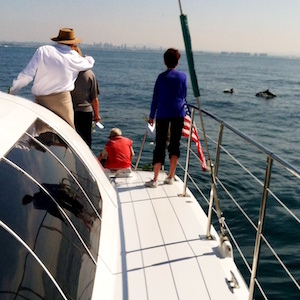 If you’re looking for a San Diego boat charter adventure to mark a very special occasion, host a corporate event, or treat yourself to a relaxing trip with great views, you’ve come to the right place! Our 58-foot Sunchaser American Catamaran is a beauty to behold, with twin 230 horsepower Yanmar turbo diesel engines and a 10KW generator. We offer 4 standard staterooms for guests (2 queen and 2 double), to allow for an unforgettable overnight adventure. Guests can enjoy taking in the sun and sights on our beautiful outer deck, or check out our luxurious interior salon with gorgeous panoramic, 360-degree views of whatever destination you choose. Being a private charter company, versatility is one of our most prominent and unique strengths. Our twin engines can race you out to the ocean faster than any conventional sailboat, but we can also cut the engines at any time for a quiet, clean sailing experience. 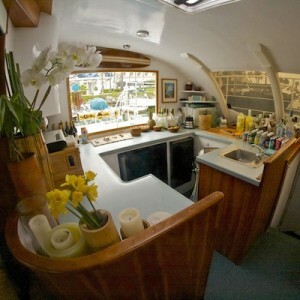 We can accommodate up to 48 guests plus crew on board at any time, and our interior and exterior spaces are designed so that in the unlikely event that the San Diego weather isn’t perfect, everyone can still fit comfortably in the salon. And while we have a wide variety of planned outings available, you can choose your own adventure, and charter the expedition that’s just right for you! 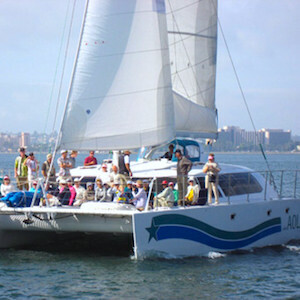 One of the many things that set us apart from other sailing options in San Diego is that we are Coast Guard certified to sail in the open ocean, not just in the San Diego Bay. 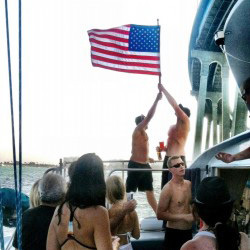 This leaves your options wide open for your custom yacht charter. San Diego has many amazing shoreline attractions for day trips as well as unforgettable overnight trips to Catalina Island, where you can anchor for one or more nights and explore that unique, sparsely populated and idyllic island. For the wildlife lover, the months of November through April tend to be perfect for getting up close and personal with Gray, Finback, and even Blue Whales during their southern migration down to Mexico. Other amazing ocean creatures such as pods of dolphins, sharks, and seals can be observed year-round as well. Our expertly-trained captain and crew make for a safe and non-disruptive experience for the wildlife, and a smooth and comfortable experience for our guests. On-board, we have modern audio-visual capabilities for corporate presentations or private celebrations with 2 interior flat screen TV’s and surround sound. Options abound for dining onboard the Aolani, from our fine selection of snacks and sandwiches, to gourmet catering from some of San Diego’s favorite restaurants. A full bar of premium liquors and wines is also available! 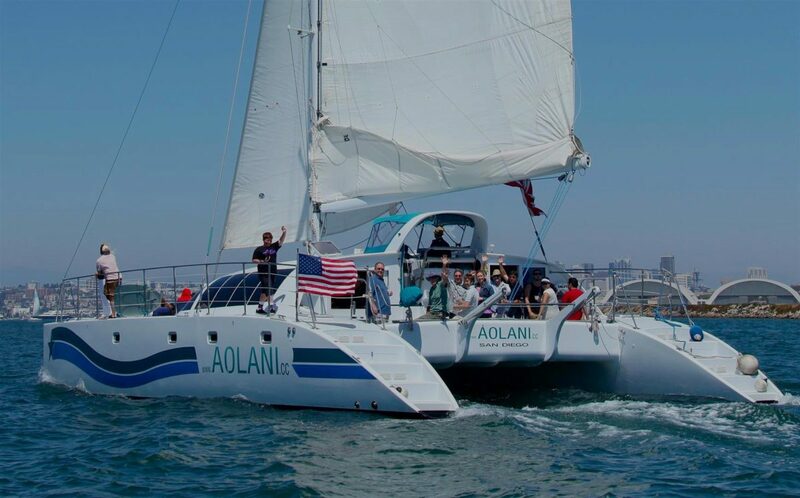 With all of the versatility of this amazing catamaran, the options for how to enjoy your chartered adventure with Aolani are virtually endless! 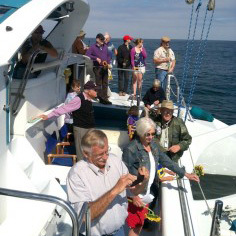 Let us help you custom design your ideal excursion on the water, with a no-obligation consultation. 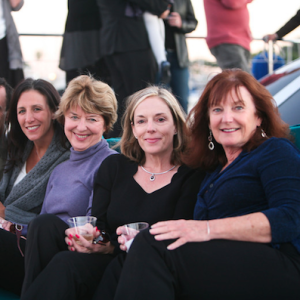 Contact the 2016 A-list winner for San Diego boats and call today and start planning the trip of a lifetime!